Nordstrom Anniversary Sale Early Access is here! I've been scooping up great staple peices! I'm always inspired by simple, timeless fashion. I like to find a piece and work a look around that special piece to create multiple looks. I've created this series to help you put together looks all from pieces on major sale right now at Nordstrom! I love a moto style jacket and find them so versatile. Blush has quickly become a neutral shade and can be paired well with light or darker tones. 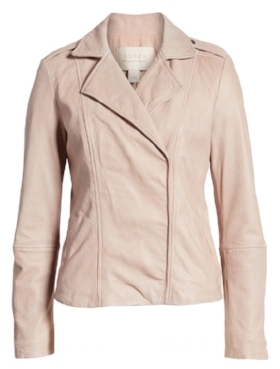 The feminine color mixed with the edgier style of a moto jacket is the perfect mix of sweet and sassy. I love these two takes on styling a blush pink moto jacket. Look one is a monochromatic grey look of grey skinny jeans and chunky grey sweater with a pop of softness in a tan bag and blush jacket. Pair this look with an animal print flat for unexpected twist. Look two is using the feminine color of the jacket with a flirty floral dress like this , this, or this. underneath. The structure of the jacket will edge up this look just perfectly! Add a sweet blush pink block heel to finish off the look. This is a great look to take you into Spring as well.